German Sunday paper FAS, which belongs to FAZ, has an article named “Hilfe, die Bank will mein Geld nicht” in today’s paper. The title translates to “Help, the bank doesn’t want my money”. The author seems to understand that low interest rates at the ECB are the major cause, but he doesn’t go further and asks why they are so low. Perhaps the German public is not ready yet for the admission that austerity has driven Europe’s economy into a hole, which even ultra-low interest rates can’t fix. Zwar ist die verbreitete Vorstellung, Banken könnten nur dann Kredite ausleihen, wenn sie vorher gleichviel Geld bei den Sparern eingesammelt haben, ein populärer Irrtum. “Einlagen- und Kreditgeschäft einer Bank sind nicht unbedingt gekoppelt”, sagt der Bonner Ökonom Martin Hellwig. Banken können sich auf unterschiedliche Weise finanzieren: über Spareinlagen, aber auch über den Geldmarkt oder die Notenbank. Banks use both borrowed and unborrowed money to make their loans and other investments. Unborrowed money is the money that a bank has obtained from its owners if it is a private bank or from its shareholders if it is a corporation, along with any profits it has retained. High-powered money is the term used to reflect the fact that the overall supply of money depends in the end on the amount of central bank money (H), or monetary base. That seems to be right. When was this written? Well, in 1898. Yes eighteen-98! 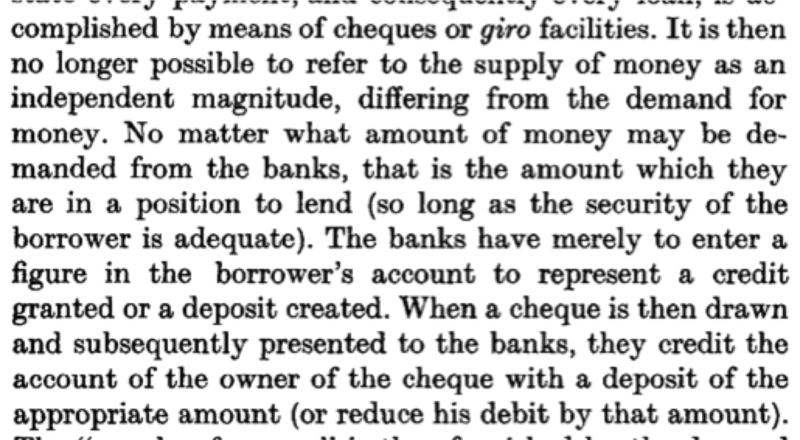 And Keynes in his early years was a ‘Wicksellian’, writing about the monetary circuit from a balance sheet perspective. Where does the money come from, where does it go, etc. If economics is a science, then it must be about a competition of ideas – which we might call theories if they are more complex – and regardless whether we like it or not, the winner should be made ‘mainstream’, by including this theory in all textbooks, and the runners-up should be put into boxes in textbooks (if they are interesting enough) and books on history of economic thought. After all, we can never be sure that we are right when it comes to social arrangements. Nevertheless, endogenous money is a theory that is able to fit with reality on a lot of things, whereas loanable funds doesn’t. Standing facilities aim to provide and absorb overnight liquidity, signal the general monetary policy stance and bound overnight market interest rates. Two standing facilities, which are administered in a decentralised manner by the NCBs, areavailable to eligible counterparties on their own initiative. Counterparties can use the marginal lending facility to obtain overnight liquidity from the NCBs against eligible assets. The interest rate on the marginal lending facility normally provides a ceiling for the overnight market interest rate. Counterparties can use the deposit facility to make overnight deposits with the NCBs. The interest rate on the deposit facility normally provides a floor for the overnight market interest rate. The marginal lending facility is open 30 minutes after the closing of the market. If banks borrow more reserves after markets closed, there is nobody at the ECB or its member central banks who could counter the increase in reserves. French far-right leader Marine Le Pen would reach the final round of a presidential election if voters were to vote now, winning more votes than any mainstream party in the first round, a poll showed on Thursday. The survey by pollster IFOP showed Le Pen winning 26 percent of all votes in round one of the two-round election, versus 17 percent for either President Francois Hollande or his more popular prime minister, Manuel Valls. The next presidential election is in 2017. The end of Europe as we know it is what it could mean. I can’t find the full article online, but from the excerpt I am not sure if Hellwig really does understand endogenous money. translation ~ Banks can finance themselves in various ways: from deposits, but also from the money market or the central bank. And I think that is entirely consistent with loanable funds/exogenous money, if one is talking about an individual bank. From the point of view of loanable funds/exogenous money, reserves are essentially a raw material that banks need in order to make loans. In other words, according to loanable funds/exogenous money, the banking system as a whole cannot make more loans than the quantity of overall system-wide reserves allows (given the reserve requirement and money multiplier). But that does not imply that any individual bank is limited in its ability to lend by its own deposits. From the LF perspective, Bank A can make more loans by borrowing reserves from Bank B. And in that sense, even with loanable funds, the reserves deposited at Bank A do not constrain Bank A’s lending. The key point of endogenous money, however, is that if Bank B lends reserves to Bank A over the interbank market, that does not in any way reduce Bank B’s own ability to make loans. However, there is not – at least explicitly – any recognition that the central bank *has* to provide reserves if it wants to hit an interest rate target and maintain the stable functioning of the payments system. He may think that the central bank can lend reserves to banks if it so chooses, but may not be aware of mechanisms that will force it to do so. You are correct. I also don’t think that Hellwig understands endogenous money. He writes that banks can finance themselves with savings accounts, which is not correct. If you mean by “finance” the acquisition of reserves via either money market or central bank, then deposits of savings are useless. You need reserves. I could go to the bank, sell them my house, and keep the “money” in a savings account. That doesn’t finance anything on the money market, because there is no inflow of reserves for the bank. On the other hand, somebody who moves deposits from another bank to your bank helps you with liquidity, because in clearing you will acquire reserves. So, it is not a question of “savings” vs “checking” account. Of course, somebody moving from checking account to savings account diminishes the need for reserves. However, the question is whether those deposits in the checking account have been created by you or not.